Before long, mental illness will be the most prominent, if not the most common, ailments suffered by Australians. One in four young people suffer some form of mental illness during their school years. In an average classroom of thirty school students, seven will develop a psychological condition such a depression. Only two of those seven will seek help, while the other five will continue their daily routine without the benefit of any aid whatsoever. But students – and those who care for them – can and do have the capacity to take proactive steps to live a more holistic life while in school, so as to ensure not only academic success, but also to emerge as more rounded and balanced people. "In a classroom of 30 students, 7 will be suffering from mental health issues. Of those 7, only 2 will seek help, leaving 5 students suffering in silence." "1 in 5 Australians will have suffered from depression by the age of 18." "75% of mental health issues occur before the age of 25"
"In spite of these figures, young people are less likely than any other age group to seek professional help." "10% of proceeds of book sales were donated to Batyr"
A litigious culture, extreme hours and relentless pressure – both internal and external – can all take their toll. Young lawyer Jerome Doraisamy learnt the hard way how pushing yourself to the physical and emotional limit can wreak havoc on your mental health and wellbeing. Over an 18-month period starting from late 2011, including one period of hospitalisation, he suffered from severe clinical depression and anxiety. 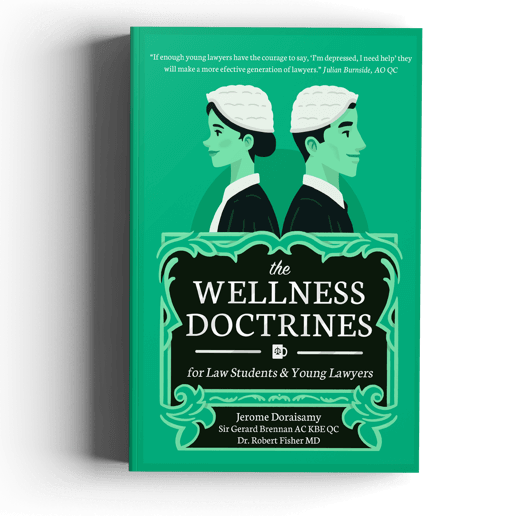 His first book, The Wellness Doctrines for Law Students and Young Lawyers, addresses the crisis in the profession head-on, offering practical tools and guidance for young legal professionals via insightful case studies from academics, managing partners, senior solicitors, graduates and students. Showcasing a “by lawyers, for lawyers” approach, this book provides the inspiration a young legal professional needs to take charge of his or her health and wellbeing. "⅓ law students and lawyers will suffer from psychological distress, anxiety or depression"
"50% have suffered at some point "
"70% know somebody who is currently suffering"
"10% of proceeds of book sales were donated to Tristan Jepson Memorial Foundation"
"“High school should be the best time in a teenager’s life. But the reality is for some kids it’s a bloody nightmare. This book is full of proper advice about dealing with the big stuff, not sweating the small stuff … and nailing it by graduation day.” "
"“We know so much more about mental health than when I was a teenager. I wish people talked about metal self-care back then.” "
"“We need to make mental health our number one priority. 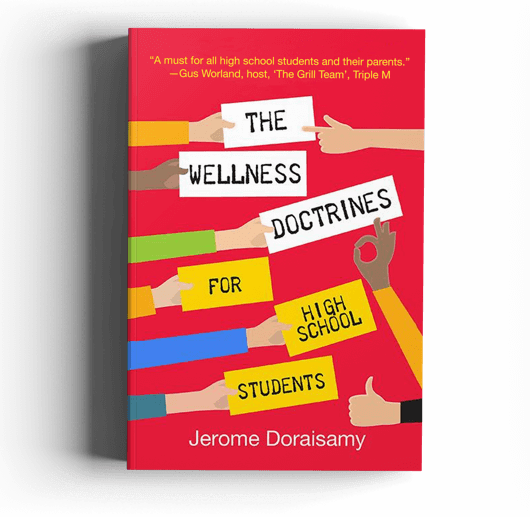 This book gives great insight into recognising, acknowledging, and dealing with the pressures of being a high school student.” "
"“A resource such as this book is a must-have in helping adequately support both parents and students in creating the environment where teens look after themselves … for the benefits of all.” "
"“Jerome Doraisamy deserves the appreciation of all law students and junior lawyers for his considerable contribution to the discussion about mental wellbeing in the study and practice of the law. His new book provides very helpful and practical guidance to law students and young lawyers on how to safeguard and care for their mental health."" ""This valuable new resource will hopefully also be read by friends, colleagues and managers, so that legal workplaces become non-stigmatising, supportive and productive environments for everyone.”"
""An extremely important book that needed to be written ... one that should be required reading for all law students and everyone involved in the legal profession." "
"“An open and honest account of personal stories and experiences within the legal professional, The Wellness Doctrines will aid in the on-going positive changes that are occurring in the legal fraternity so that everyone addresses their mental wellbeing as well as to support those with mental health issues.""